How are Paper Jewels made? First I do a sketch (all my designs are original, and copyrighted), then save it as a graphic file. I make from one to four copies of the design for the front and back, depending on whether it is a pin, pendant, or earrings. I cut additional layers of paper to make the work stronger (and thicker). The more delicate pieces (some of the animal pins, for instance) also have a metal armature (tiny skeleton) for additional strength. After the layers of paper are cut and glued, and earwires or other "hardware" inserted, I hand-paint the edges of each piece. They're thin but definitely three-dimensional! Then the lacquering begins. There are four to six layers of lacquer applied to each piece (both sides and the edges). Of course there is drying time for each layer and that's why the work takes a week or so to complete. Some of these earrings are big! They must get heavy. You've just found one of the major advantages of using paper. 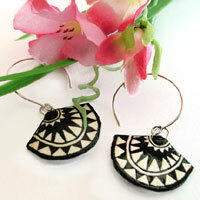 Even the large earrings are lightweight when compared to all glass or metals. When I use gemstones or pearls, there is additional weight - but the earrings are still lightweight and comfortable. Isn't the jewelry very fragile? It's just paper! Not at all. In multiple layers, and with the protective lacquer coating, the pieces are quite strong. I'm still wearing Paper Jewels made over 15 years ago. To my knowledge, Paper Jewels can't be accidentally torn. I've never had a customer mention it to me, and it's never happened to the pieces I've kept in my own collection. They're strong! I like kanji jewelry but there's something different I want to say. Can you do other kanji? Absolutely. :-) Please email me to discuss. What I really want is my own name in kanji. Can you do that? What does the back of the jewelry look like? The drop earrings and all the necklaces have designs on both sides, because of course either side will be seen. The clip earrings and pins are usually finished with a solid color back. Can you make the jewelry in other colors? Absolutely. For example, all of the personalized jewelry is of course custom work. Because there are invariably extra emails, ideas, and pro-and-con discussions, custom work can be more expensive than the pre-made work shown onsite. But not much. :-) Contact me and we'll go over the details. What are the earwires made of? I use sterling silver or gold-filled earwires, as well as unplated brass leverback (locking) earwires. Unplated brass is much more user-friendly than plated metals, easy on sensitive ears. I can also provide other metals (hypo-allergenic niobium, for example). Tell me what you need and I'll let you know if there is an additional fee. And I can usually exchange earwires for earring posts, or vice versa. Additionally, many styles can be made as either clip-ons or pierced, as you prefer. If there's a question I forgot to answer, or other info you need, just send me a note!